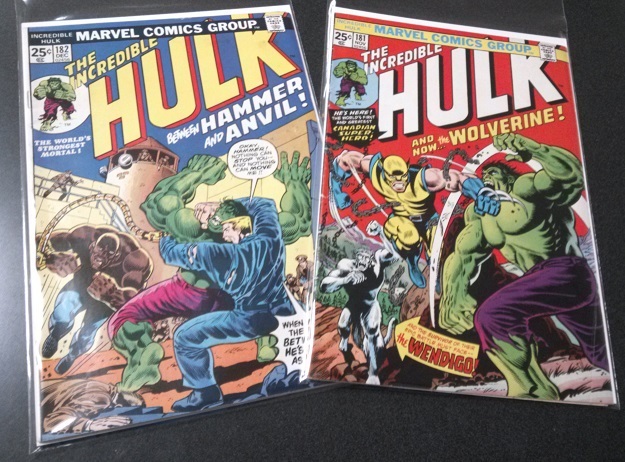 Just arrived… Incredible Hulk #181, featuring the first full-length story appearance of everyone’s favorite X-Man, Wolverine, and #182, featuring a brief Wolverine cameo! They are both currently on eBay, so just click those issue numbers to be whisked away to their respective listings! We’ve been acquiring some great collections here at Sterling Silver Comics of late…a big ol’ pile of Dark Horse Star Wars comics, lots of 1950s Disney and Warner Brothers comics, a selection of 1970s Amazing Spider-Man and Avengers , and more goodies than can be listed here! They’re coming in so fast, we barely have time to get them put away, as the piles of back issues on the counters attest to! So help your pal Mike out…come buy some of these books before I have to find room for them! This entry was posted in Comics on May 29, 2015 by Mike.